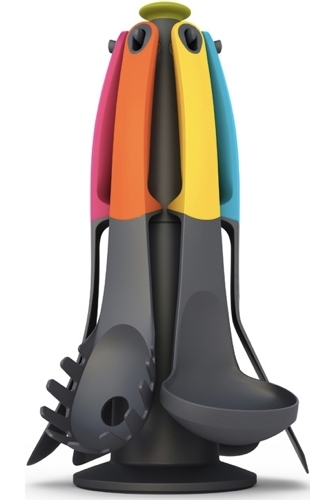 The lusciously colorful Joseph Joseph Food Preparation Nest looks so strikingly cool that it can take some time to realize how practical it is too. Mixing bowls, colanders, measuring cups and other such things that clutter counter tops stack together within the smartly designed Nest. All the pieces are dishwasher safe and the bowls all have large, non-slip bases. But our favorite feature is the way everything within a Nest intuitively stacks together, with gaps between the pieces. If you want to get a large measuring cup in the middle of a Nest, for example, you don’t have to take the whole thing apart—you can easily reach in and get it. There are several versions of the Nest to choose from. 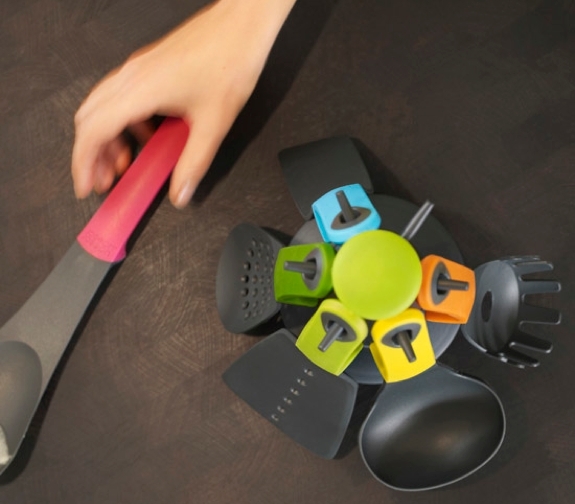 Some stack as few as three items, but Spot Cool Stuff is partial to the Joseph Joseph Nest 9 Plus Compact Food Preparation Set. It includes five measuring cups—teaspoon, 1/4-cup, 1/3-cup, 1/2-cup, 1-cup—as well as a stainless steel mesh sieve, 1/2-liter small mixing bowl, 3-liter colander/strainer and a 4-1/2-liter large mixing bowl. The full Joseph Joseph Elevated Set includes a rotating storage stand and six utensils: a spaghetti server, slotted spoon, ladle, slotted turner, solid spoon and flexible turner. You can also buy the utensils separately or purchase the set without the stand, though the springing entire set is a better value. Each utensil is heat resistant and dishwasher safe. There are other combination knife-cutting boards designed for the chopping of small items such as herbs. 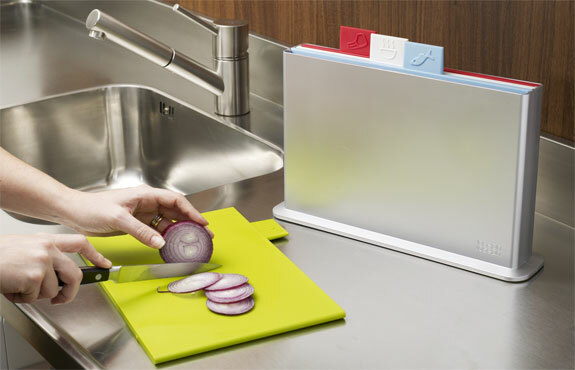 But the Joseph Joseph Compact Herb Chopper and Chopping Board is the only one we’ve seen with a curved top. 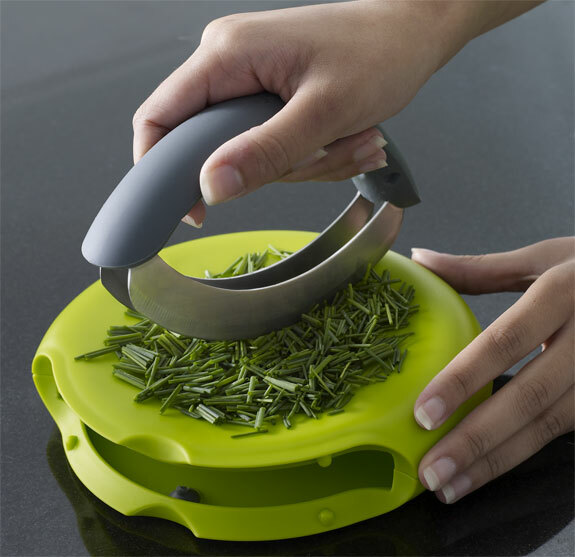 That curvature makes it easy to slice through herbs by rolling the included chopper back and forth; it also means that the herbs all stay on the board while being chopped. But don’t let the name limit you—the Joseph Joseph Herb Chopping Board also works well with foods like garlic, ginger, nuts and chocolate. Cutting boards absorb the smell of whatever is cut up upon them. Use the same board for all your food and, over time, it will start smell like a less-than-pleasant concoction of meat, garlic, onions, oranges, fish and whatever else. The Joseph Joseph Index Chopping Boards make it intuitive to keep your cutting boards dedicated to a certain food type. The boards are each color coded and organized by an index system. 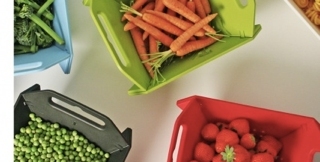 If you are really keen on preventing cross contamination in the process get the Index Plus Chopping Board—it includes color coordinated knives. 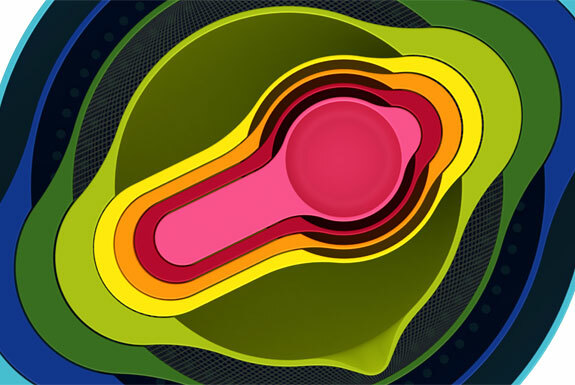 Most graters take up a lot of space. Not so with the Joseph Joseph Grater. It folds flat for easy storage. 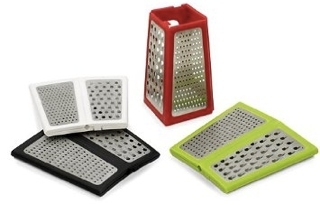 The dishwasher safe grater features one side with coarse stainless steel blades and one with fine. Take your pick of white, red, black or green. 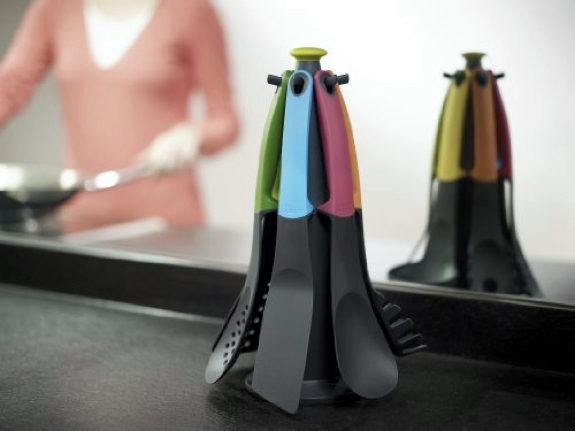 After saving some cabinet space with a Joseph Joseph grater (above), continue the trend with Joseph Joseph Folding Colandersr. What’s cool about then—beside the fact that they fold flat and come in multiple colors—is that they look snazzy enough to serve food in. Get a selection of these colanders to bring various dishes to the table. 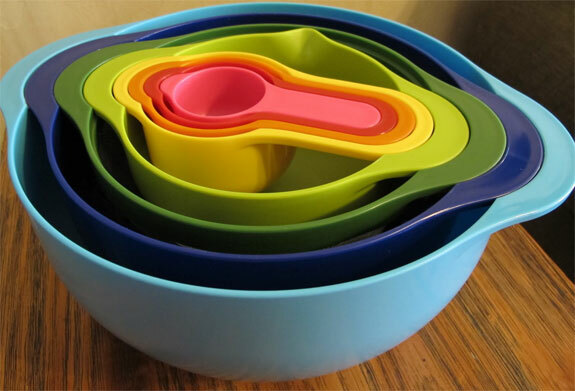 In the same way that the Joseph Joseph Food Preparation Nest (above) colorfully combines a variety of bowls and cups, the Joseph Joseph Nest Utensils provides a space saver for utensils. 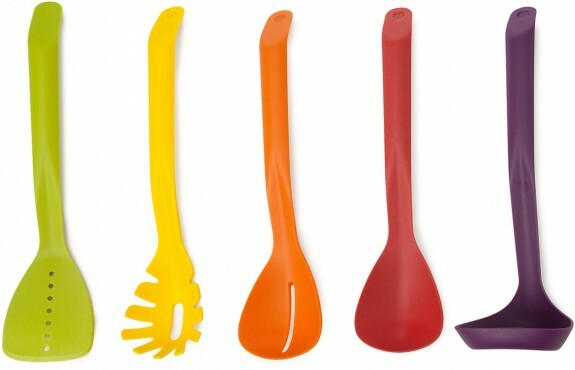 The set includes a slotted spatula, slotted spoon, solid spoon, spaghetti server and ladle. 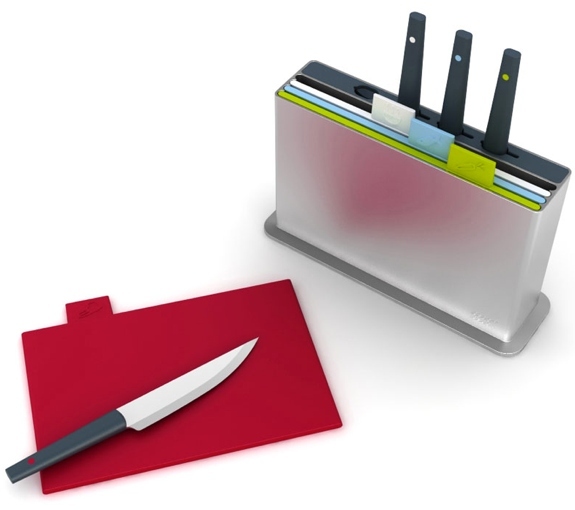 Those five utensils stack together and sit in a slim storage base; they are held together by tiny magnets embeded in the handles. It’s altogether very cool-looking. And the Joseph Joseph Nest Utensils Set takes up much less space than that pot with cooking utensils sticking out of it that most people have on their kitchen counter. These products look really innovative. That food preparation nest is a really great idea for people with limited kitchen space. Also, the utensils with the weighted handles are something I’ve never seen before and is a product I could really make use of. I hate leaving a mess whenever I set a spoon down while cooking. just looking at these utensils makes me so happy. i especially like the joseph joseph food preparation nest. this is the first time i’ve seen a set that includes a sieve and a colander– what a brilliant idea!